A car full of teenagers and young adults left the roadway and fell down an embankment at approximately 2:38 a.m. this Sunday morning. Four people were transported to various hospitals; one was pronounced dead at the scene. According to Trooper Rick Johnson with the Washington State Patrol, the car left a bonfire party and was traveling westbound on State Route 410. The 1990 Honda Accord driven by 18-year-old Bryson Stubbles left the roadway, fell down an embankment, and struck a tree. 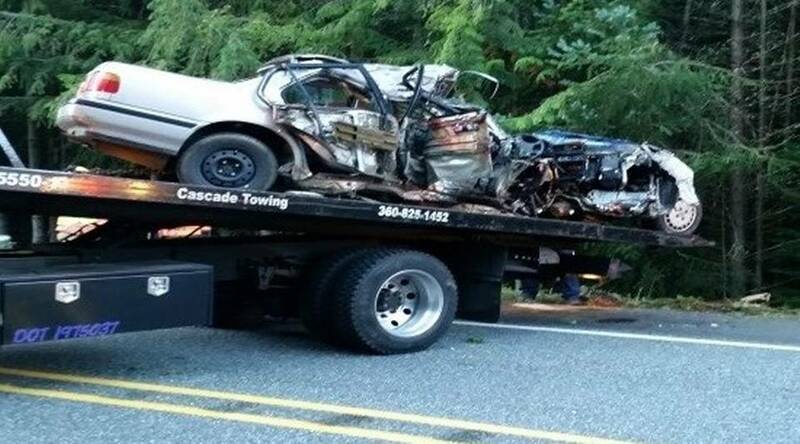 The Washington State Patrol’s reconstruction of the accident shows that Stubbles drifted onto the shoulder of the road, overcorrected, and swerved back across the roadway before hitting the tree on the passenger’s side. The front passenger, 18-year-old Paco Frees, died at the scene. Stubbles and a 16-year-old passenger were airlifted to Harborview Medical Center with serious injuries; two other passengers were transported to local hospitals for treatment of their injuries. A nursing supervisor declined to give information about Stubbles’ condition to reporters on Sunday afternoon. Investigators found that Bryson Stubbles showed signs of impairment. He is now in custody for three counts of Vehicular Assault and one count of Vehicular Homicide. Detectives are currently searching for more information about the events leading up to the drunk driving collision. If you have any information about the circumstances of this wreck, call Detective Russ Haake at 425-401-7717. The vast majority of adults in America now understand that driving under the influence of drugs or alcohol is against the law. What many don’t understand is that drunk or high drivers who get into wrecks can be charged with other crimes if they injure or kill someone. In Washington state, it is possible that even after a fatal wreck, a driver won’t face criminal charges if they weren’t intoxicated, driving recklessly, or behaving with disregard for the safety of others. If they were doing any of those things, however, they may be charged with vehicular homicide. Vehicular homicide is a class A felony under Washington state law, and an additional two years can be added to an offender’s sentence for certain prior offenses. Vehicular assault is treated similarly under Washington state law. Not every person who gets into an accident will face criminal charges, even if they were clearly at fault for causing someone else’s injuries. Drivers who may face charges for vehicular assault are those found to be under the influence of an intoxicant, operating their vehicle in a reckless manner, or operating their vehicle with disregard for the safety of others. Vehicular assault is considered a class B felon in Washington state. These charges are handled in the state's criminal court system. Car accident victims who have been injured may also receive compensation for medical bills, time off work, lost future earnings, and other damages by filing a civil claim. If you or a loved one has been injured by the actions of a reckless driver, it may be time to speak with a personal injury attorney who can help you understand your legal rights.